We are all, from an early age, trying to figure out how this whole thing works. For me, drawing was a way to artificially create an environment where I could control my own little version of life that made sense to me. In our oldest son's middle school, all 6th graders study Latin. Up until this point, he has studied Spanish. But in middle school, students enter from other elementary schools join students who have already been here in the elementary grades. And in order to level the playing field for everyone and begin to develop a sense of community, they teach Latin. And everyone starts from the very beginning. Latin. As a community building tool. Rather genius. Clearly this school has thought about the power of words, the power of whether you have them or not. And what happens when you take them all away. I am aware that what I am about to talk about is rather ironic, given the recent buzz about the importance of young children's exposure to vocabulary, literacy, and spoken language. We are revisiting the gaps found between children of lower income families and those of higher income families in terms of preparedness for school. And discussing how these gaps should or should not guide early preschool curriculum and the potential funding of such public programs. However, in the wake of these reminders of the importance of parents talking to their children, from a very early age, filling those young and developing minds with connected and engaged discussion, I give you this: the importance of books without words. I offer to you the idea of sitting for a bit with your children without words, and even more, without making eye contact. Because, instead, you are looking at pictures. You are looking together, in silence, at a book. Together, perhaps in this cold weather, in front of a fire. With your middle school fantasy reader on one side of you, and your beginning reader, a somewhat reluctant reader at that, on the other. A few years ago, we attended a story time with Megan Lambert in the library of the Eric Carle Museum of Picture Book Art in Amherst, Massachusetts. The Carle is a special place for my family, one we have visited often. That day, in the library, in which picture books are arranged alphabetically not according to their author's name, but rather by illustrator, was a good one. One that shifted my thinking in a couple of ways. Even just the organization of the books. That shifts one's perspective. As you move about the library trying to find an old favorite, you often cannot at first, because we typically focus so very much on author, on the person who provided the words to the story, not the pictures. I also observed and learned how differently children will engage with a picture book when it is read, as it was by Megan that day, by reading the pictures and the words. She gave the illustrations, as she sat there in the shadow of original art by Eric Carle, the same level of attention as the words. She talked about the end pages, the colors, and wondered together with the large group of squirrely children that day about the art, about why the illustrator created the artwork in certain ways, about the parts of the story that the words do not address, such as facial expressions, predictions of plot, and many other examples of engaged and interactive reading. For Elliott? This library is a library of his mind, mapping on to the way he thinks. He identifies books in the book store or books on the newly acquired shelves at the library by their illustrations. He says, that book is by the same person who did Amos McGee, or even those pictures remind me of the Spiderwick Chronicles when he saw the Guardians of Childhood series illustrations by William Joyce. Our youngest? He is like Harold in Harold and the Purple Crayon. Or Leo Lionni's Frederick. He draws, crafts, sculpts, and visualizes his way through the world. And if it weren't for a very skilled and patient teacher in his life, he would do this all day long. Luckily, we have this teacher, and Elliott, with her guidance, is willingly learning to read. But really? He thinks in pictures. And often, when I sit down to read aloud to him from a library book that has been on the bench for a few days, he has already read it, in his own way. I know he could sound out the words and identify many of them, but he does not, without urging, choose to do this yet. Instead, he reads the pictures. And does so in ways that demonstrate a visual literacy that I can only dream of having. And often, given that he is inferring clues from the pictures, from the facial expressions, from the details of the pictures, from what changes from page to page, he is making a story that is very different from the one that I then read to him. Which can lead to some very funny and interesting confusions when I start to tell him a story that differs from the one he has told himself. Often he will ask me the name of a book, you know the one where the fox keeps secrets and nobody plays with him and he is sad? Given that I tend to think in words, in the written stories, I often have a very hard time connecting my sense of a story with what he takes from it. We know that Elliott understands what he sees, that he makes meaning of his world in pictures before words. Elliott brought a schoolwork packet home with him from school the other day. The first page of the packet was October's Calendar, completed by Elliott. All of the numbers of the days of the month were written by him in the appropriate boxes on the calendar grid. And at the top of the page was a very elaborate and carefully drawn picture. The picture was a keeper. It was true Elliott. And down below, every one of the 5's on the calendar was backwards. He rushes through his worksheets in order to be able to have more time to work in his journal. To get back to the pictures, I thought to myself when he told me he had made lots of mistakes on a worksheet he showed me because he was in a hurry to work on his journal. 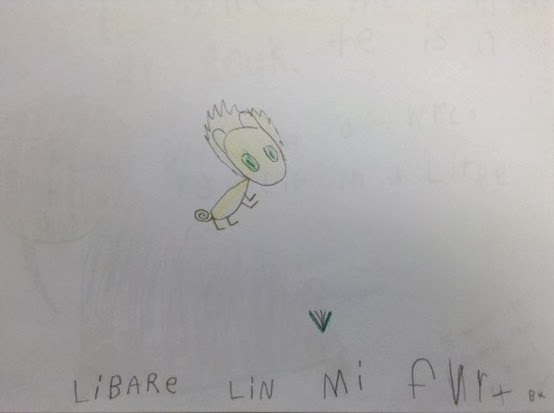 He draws pictures in his journal and then uses invented spelling to tell the story that goes along with his pictures. This journal is what he likes to do. I felt a tremor of worry. Will this boy learn to read? Do we have a situation on our hands with this, our third and last child? And then, a few days later, Elliott took me over to his journal. And wanted to quietly share his work in it. 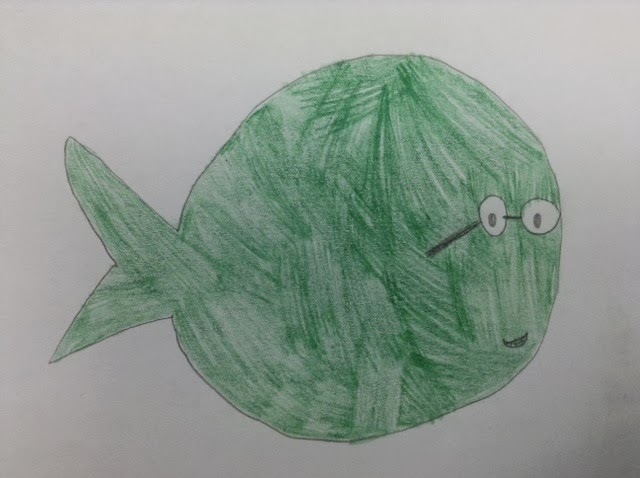 Library Walrus, my made-up book. 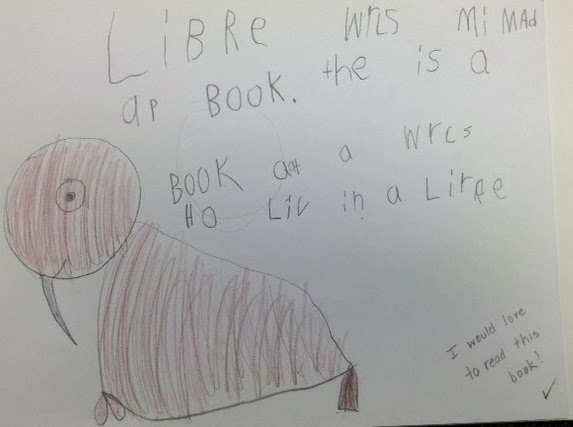 It is a book about a walrus who lives in a library. And I was overcome with a very familiar wave of I am a terrible mother, thinking back on my reaction to Elliott's worksheets, fortunately kept to myself. This boy knows how to tell a story. And he knows how to read one. And he carries these stories with him, drawing on them for his imagination, creation, and learning. Worksheets, schmerksheets. 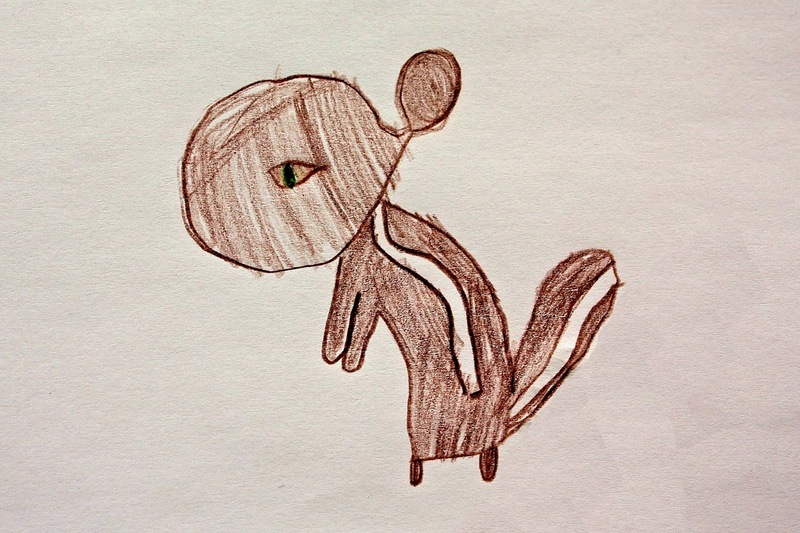 Once there was a chipmunk and he lived in a book. This is really the crux of what we hope for our children, for our lifelong readers, right? Journey, by Aaron Becker, has worked its way into our library bag, after reading a good deal of buzz about it as a potential Caldecott contender this year. This is a book that encourages visual literacy at its finest. I know this because, as I read it with the children, they had to encourage me to go back a few pages in order to see a detail that I had missed and therefore was confused about the story. Reading a picture book without words with a child, such as Journey, offers many moments for observation. Just like the backwards fives, Elliott was sometimes narrating the story for me moving from the right page back to the left, Japanese Manga style, perhaps. It gave me a chance to remind him that in our books, the pictures always move from left to right. Also, when I asked Nicholas (our former reluctant reader) to read the story aloud, to narrate what he was seeing, he struggled a bit at first and was feeling self conscious. I asked him is this weird, is what you are saying aloud different than what would be going on in your head as you looked at the book? He said, I guess I would be noticing everything in my mind, but I wouldn't have to put it into words for you. Putting it into words makes me notice more and makes it a fuller story, but it is more work. Is this noticing more by putting things to words a difference between people? Or is visual literacy something that gets lost a bit as text takes more precedence. Is Nicholas somewhere between Elliott and I on the continuum, on this path of noticing, moving from illustrations to text? I am thinking it is a little bit of both. That Elliott will become more text based as he moves toward more independent reading. But I also think there is just something about Elliott that will allow him to always be the kind of child who stands quietly and observes and sees things that the rest of us would not notice. He will always be a visually based processor. I knew, had already read about, the connection between Journey and Harold and the Purple Crayon. But I had not said anything about it to the kids. When we got to the page that showed the girl falling through the air, a circular line being drawn by her red crayon in her hand, Elliott gasped. Without saying anything, he got up from the floor and walked over to the book shelves. Stood for a bit, dug around for a few more moments, and then exclaimed, yes! And returned, with Harold in hand, skipping a bit. And laid down on his belly. And flipped to the page on which Harold also falls, his purple crayon dragging behind him. Both characters across separate books, come up with the same solution: a hot air ballon. Nicholas and Elliott both noticed details I had not. Nicholas noticed the map on the girl's bedroom wall before she went into the imagined world, and then that each new place in the story seemed to have details that were specific to different geographical locations, such as the Asian lanterns, canals like Venice, and Arabian architecture. Nicholas said, it's cool. I like how the pictures keep using specific colors. It's like in The Red Book. With the color red. I like how she can draw things and use them like how they would be used in real life, Elliott said. That was an interesting comment to me, as in my mind, the act of drawing a simple version of an object conjured up the real object, and therefore made these objects real. In Elliott's mind, these objects were drawn and remained pretend, just usable as if they were real. It was a small but interesting difference. And one I would not have thought about otherwise. This theme of connected reading. Between people reading a book together. But also of the opportunities that some books give children to draw connections between different books, between different stories and their characters. Between illustrators. I noticed it when we read Linda Urban's Center of Everything, which drew upon the story of L'Engle's Wrinkle in Time, and Stead's When You Reach Me, spun some of the same ideas, of time travel or time bending and looking for clues in the world around you a bit differently...to spin a different tale. In Stead and Urban's books, words connect the stories. Becker accomplishes the same thing, with pictures. These books without words. By taking away words, we use our eyes more. Observe more. Notice small things. Look for clues. In this quieter place, it is as if time can stand still for a few moments while the illustrator's world is frozen for us, and we can look, listen, wonder. We do not turn the page where someone else will tell us with their words what happens next. Because that place where ambiguity meets the flood of meaningful information that comes to us visually, when pictures are done well, is where a story can take off. And in unexpected ways. And once this breath full of time and observation has been exhaled, we are perhaps more ready to spin tales ourselves, to reference other stories, to look for what can come next. To turn the page. The mental flexibility that wordless reading supports. In books, but also in life. The knowledge that two people can stand in front of the same picture, or the same map of the world, and see very different things. I believe that this kind of reading, this kind of literacy, will allow children -- in the future and when their minds permit it -- to draw connections between different ideas, different perspectives, different possibilities. We will see them better able to wonder about problems, hear them say I know somebody else that that happened to, I remember another time when we did this and what happened, I see something there, another explanation, that we might have overlooked. This is a critical skill. And a powerful one. So, though I am a strong believer in the need to talk to and read to your children in connected and engaged and interactive ways, I want to remind everyone of another need as well: to sometimes sit together. Next to each other. In silence. Not putting words to pictures before your children's minds have had a chance to make the pictures into their own stories. The format of a wordless book came about pretty naturally for me. I wanted the pictures to really tell the story. And I like how the reader has to figure out what is going on. It forces them to have to sit there and take it all in without feeling like they have to turn the page and keep reading. But making it work is a whole other question and you have to solve all your problems visually. You have to tell the story without using language. Taking away words. It allows my different aged readers and me to read a story together in wonderful ways. It allows children who do not know each other to move forward together and make a story of their own. It forces everyone to develop a common story, together. And it reminds us to always carry a crayon, in case we fall. Because that crayon can give us the ability to write, or draw, our own future.